First time is the most difficult, when it comes to buying your aquarium live stock. We need be cautious of what we bring back home. First time the tank is being tested, we recommend go slow on the live stock. These fish travel a long way, before they enter your aquarium. We also recommend buy fish food with the fish or before buying the fish. First time buy usually ends up with a pair of damsel fish and there is a huge selection. Azure are least aggressive fish in their family. They have striking gold color from their belly to tail. They are easy to keep and care, they are very hardy in nature. Most of the time they immediately start eating pallet or flake food. Being a reef species, this fish is found in larger population in the Coral triangle, located form the Solomon islands to Indonesia, Bali and the Philippines. They can grow up to 3 inches in length. Keeping other small or equal size tank mates should be with caution as they would defend their territory. Aquarium plenty of rock work and hiding spot is ideal. It can tolerate certain level of changes in the water parameters, this is a popular fish among hobbyists. This fish would just bring colors to your aquarium. Clowns are the most common starter fish after Damsel, there are different patterns of clowns available. Widely distributed Anemonefish chiefly found in the western and southern parts of the Pacific Ocean. Like all Anemonefishes it forms a symbiotic relationship with sea anemones. They would feed on flakes and pallets, they are easy to care and is a great beginner fish. They can be kept singly or in true mated pairs. A. Melanopus adults can grow up to 4.7 inches. These species has successfully been bred in an aquarium. A. Melanopus may become territorial and aggressive once established in a tank. Tank bread are easy to feed and keep. There are no complicated set ups that are required for this fish. They can tolerate slight variation in the water parameters. The Pajama Cardinalfish is one of the most different looking of all fish species. The Pajama Cardinalfish is most suitable for nano reef tank due to their size and temperament. The Pajama Cardinal is easy to keep as well as inexpensive, they adapt really well to aquarium life. They swims slowly and they are a non aggressive fish. They swim to their own tune and keep to themselves. Some may also try to hide themselves against long spined sea urchins. Once added in the tank they immediately start eating. Pajama can grow up to 3-4 inch in size. Their unique structure makes them a very good stater collection. They are found in Fiji, Indonesia and Sri Lanka. They eat most of the food variety available. They are advisable to be kept with the non aggressive community tank. A very popular fish among the hobbyist community for its striking colors. They can grow up to 4 inches. Chromis is easy to care for, beautiful, and peaceful fish. They belong to damsel family. They are found in tropical and subtropical waters near to coral reef. They are reef safe and should be kept with non aggressive tank mates. They easily feed on flakes and pellets. 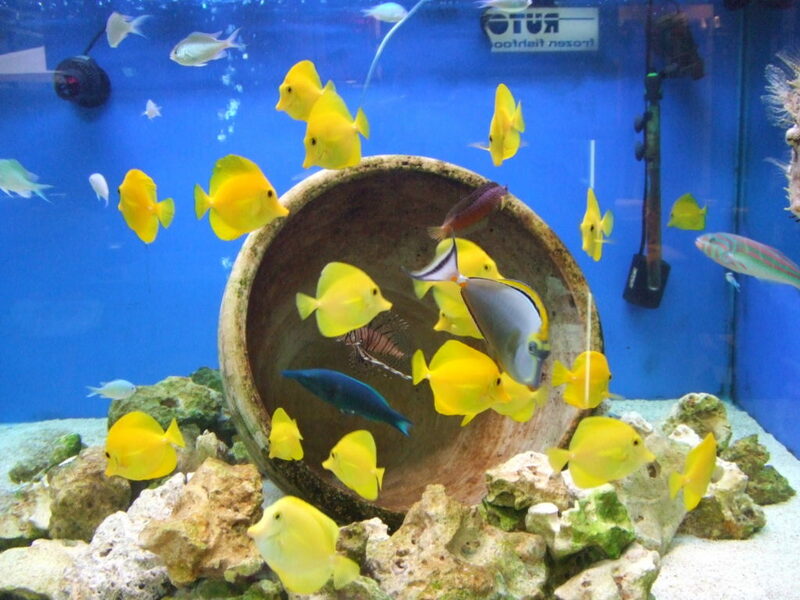 Adding more than one Chromis would bring the shimmer in the marine aquarium. You will notice that they have slight color variations from a pale green to a light blue. They are moderately hardy, great for beginner tanks and can live up to 15 years with good water quality. This fish is very much suitable for first time purchase. Some hobbyist have successfully bred the Blue Green Reef Chromis in their home aquarium. This is a famous fish everyone know Nemo. There are plenty of variation now, as the industry is successfully able to bred them in aquariums. They are easy to keep and our first choice as a starter fish. They can grow up to 4-5 inches. Clownfish is an aggressive eater. It will eat most food available. Like other Clownfish they also have a symbiotic relationship with the sea anemone. A. ocellaris male can change its gender to female during its life period. It’s vibrant orange body dressed with white bands outlined in black brings colors to the marine aquarium. We recommend you to avoid keeping first time along with Damsels. They are peaceful in nature and should be kept in a community tank. they are reef safe. A. ocellaris typically lives in small groups on outer reef slopes or in sheltered lagoons at a maximal depth of 15 meters. We suggest you do your homework before you buy any live stock as a first time buyer you might not be equipped to host them.